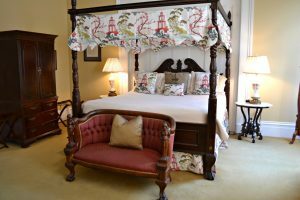 , For over 80 years, the Savannah Tour of Homes & Gardens has given visitors a rare glimpse into the private lives of Savannah locals. This three-day event is held each spring and showcases the city’s rich history. Enjoy exclusive special events, watch presentations, and admire the furnishings that have been treasured by families for generations. It’s a great way to experience Savannah like never before! Here are some things you’ll see along the way. Discover even more things to do and see in Savannah when you access our complimentary Vacation Guide! When Is the Savannah Tour of Homes Held? The time of the event changes every year, but the Savannah Tour of Homes is usually held at the end of March. Guests get to see historic homes all over Savannah. Each day is dedicated to a different district. Districts shown in the past have been the Southeast Victorian Historic District, the Western Historic Landmark District, the Eastern Historic Landmark District, and the Ardsley Park-Chatham Crescent. View the beautiful architecture each home has before stepping inside. Many homeowners have gorgeous antiques displayed, and you can easily picture how the first residents lived long ago. If you’re planning on attending the Savannah Tour of Homes, make sure you get your tickets as soon as possible! Tickets are known to sell out quickly, so getting them in advance is your best bet at being able to attend. Certain events have more limited tickets than others, so get those tickets early! Tickets to the events can be purchased online, by calling, or by mailing in a form. The Savannah Tour of Homes & Gardens is a fascinating event for guests of all ages. In between your adventures, feel free to unwind in one of our beautiful rooms or suites. Our historic B&B is just steps from some of the most beautiful homes in the city! We can’t wait for you to see the gardens, homes, and squares that we love so much! Book your stay with us today.